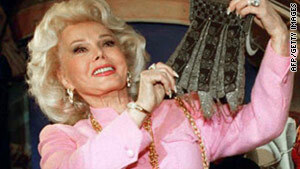 Zsa Zsa Gabor, seen here in 1996, is scheduled to have part of a leg amputated, her representative says. Los Angeles (CNN) -- Zsa Zsa Gabor's doctors took "one last shot" at saving the ailing actress' leg with powerful antibiotics her publicist said Monday afternoon. If the newest treatment at Ronald Reagan UCLA Medical Center does not heal a "very deep" lesion in her lower leg, it will be amputated below the knee, according to spokesman John Blanchette. "She has to be on very strong antibiotics for the next few days and then they will decide what kind of operation to go ahead with," Gabor's husband, Prince Frederic Von Anhalt, told HLN's "The Joy Behar Show" Monday. Gabor, whose 94th birthday is next month, has not been told that amputation is a possibility, Von Anhalt said. "I'm not going to tell my wife that she probably could lose her leg," he said. "She's going to get a heart attack." Doctors recommended that Gabor check into the hospital before Christmas, he said, but she didn't want to go. "She was crying and begged me 'Please don't bring me to the hospital over the holidays,'" he said. Her condition worsened in recent days as gangrene set in, he said. "It smells already bad,"
Her more prominent films include John Huston's 1952 Toulouse-Lautrec biopic, "Moulin Rouge;" "The Story of Three Loves" in 1953; "The Girl in the Kremlin" in 1957; and Orson Welles' 1958 classic, "Touch of Evil."